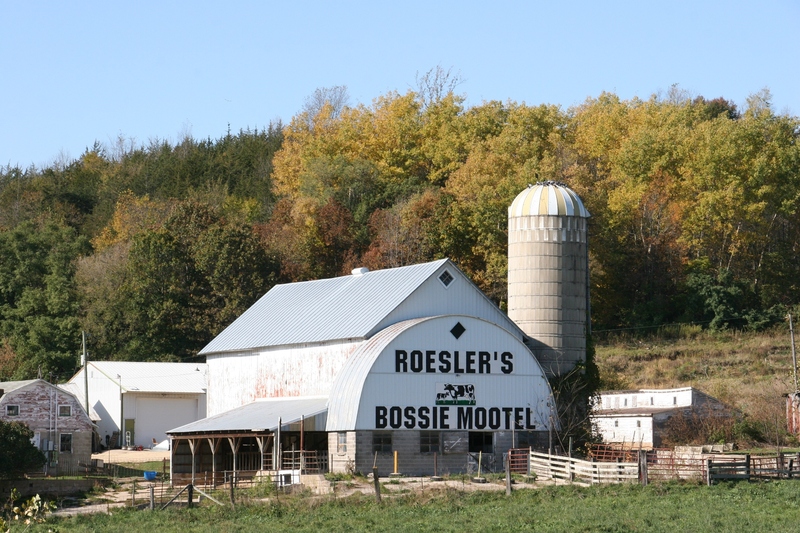 A dairy farm along Highway 14/61 south of La Crosse. 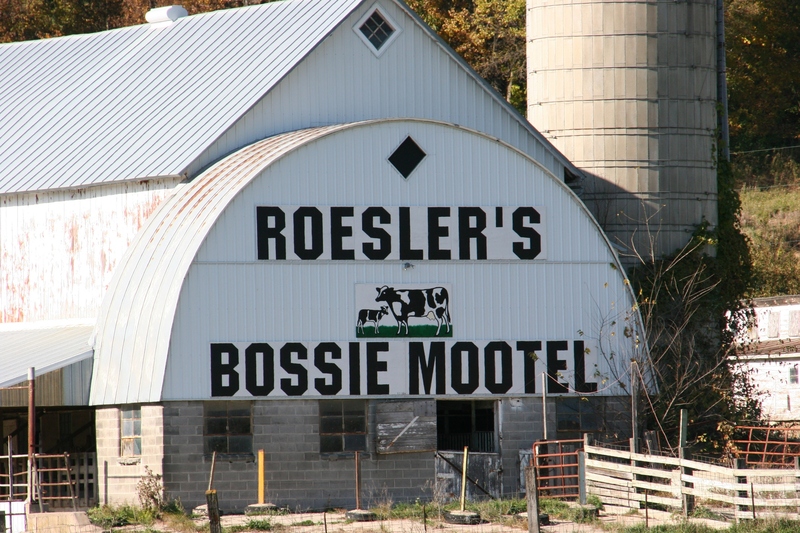 It appears, though, that this barn no longer houses cows. I’VE LEARNED A LOT about Wisconsin in the five years since my second daughter moved to Appleton on the eastern side of the state. I’ve learned that Wisconsinites are crazy about the Green Bay Packers. If you want to travel with minimal traffic through Wisconsin, drive while a Packers game is on. Most everybody will be holed up at home/a friend’s house or gathered in a bar watching the football game in their Packers’ green and gold. I’ve also learned that Wisconsin residents love their beer and brats as noted by all the bars and signs advertising Brat Fries. Grocery stores even sell brat buns dyed Packers’ green and gold. And then there’s the cheese. Oh, yes. Wisconsinites love their cheese. Big time. You can even find football and cow shaped cheeses. This state is known as America’s Dairyland. According to the Wisconsin Dairy Producers Milk Marketing Board’s 2014 data, Wisconsin produces 13.5 percent of the country’s milk and 25.4 percent of the cheese. That comes from 1,271,000 cows housed on 10,290 licensed dairy farms. Apparently New York dairy farmers who resettled in southern Wisconsin in the 1840s and 1850s propelled this region into cheese-making. New York was, at the time, the leading dairy producer. Today this East Coast state remains the third top dairy state behind California and Wisconsin. As someone who grew up on a family dairy farm—in southwestern Minnesota—I value the dairy industry. Pass the cheese, please. My brother moved behind the cheddar curtain in the 90’s. We still get together. Him on his side of the river, me on mine. “How ya doing?” one will call across the river to the other. It beats arguing about football. The “cheddar curtain,” huh? Love that. Love the sense of humor in the mootel! Oh, there have been lots of times when we’ve driven home from visiting my in-laws who live in the Oconomowoc area with the Packers on the car radio. I love the drive from here to there; Wisconsin is a beautiful state. And I like the cheese, too. I also love stopping in Madison and strolling along State Street, and going to the UW-Madison campus to sit by the lake with a beer. My husband went to college at UW-Madison and he is clearly part Badger. The Packers are one thing; the Badgers are a pretty big deal, too. I love your description of Wisconsin, especially Madison. I’ve never been to that city, but would like to visit there and Milwaukee and some burgs north. I agree that Wisconsin is a beautiful state. Spot on about driving during football. I’m originally from Wi and it is boarder line insane. Having grown up on a dairy farm, I fully understand the 24/7. Our family seldom got away. I went on two vacations my entire childhood–one to Duluth in northern Minnesota and the other to the Black Hills of South Dakota.